At Conserva Irrigation of the Twin Cities, we believe that sprinkler repair is about more than just irrigation. Conserva Irrigation was founded on a mission to bring professionalism to the irrigation industry. What will our professionalism mean to you? Professionalism is at the forefront of what we do. Understanding that first impressions foster trust, Conserva Irrigation of the Twin Cities maintains clean, recognizable trucks. 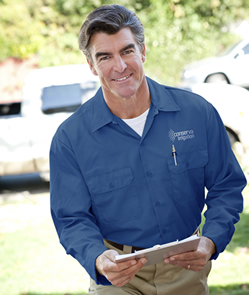 Our sprinkler repair professionals wear branded uniforms and strive to meet every appointment punctually. But perhaps the most important aspect of our dedication to professionalism is efficiency. While our trucks are eye-catching, it’s what’s on the inside that makes them exceptional, and our professionals efficient. Some irrigation service companies might arrive at an appointment unequipped to perform the repair. This is frustrating for you as a homeowner, and can permanently tarnish your view of the company’s goods and services. Conserva Irrigation technicians will arrive at your repair appointment in a well-stocked truck, ready to complete your job. To ensure absolute efficiency, Russ Jundt, founder of Conserva Irrigation, developed a system called “Conserva Pak.” Our trucks are always stocked, and our technology is operational. Regardless of what your sprinkler system needs, we do everything we can to be able to perform your sprinkler service or repair in one visit. Conserva Irrigations’ commitment to professionalism has not gone unnoticed. In fact, the January 2018 edition of Turf Magazine features founder, Russ Jundt and Conserva Irrigation in an article titled, “What’s in my truck?” Read the digital edition of Turf to learn more about “Conserva Pak” and our dedication to be the best irrigation professionals in the business. What should you expect in a service and repair technician? Preparedness matters. Efficiency matters. Cleanliness matters. Professionalism matters. Choose Conserva Irrigation of the Twin Cities for a sprinkler company that exceeds your expectations.